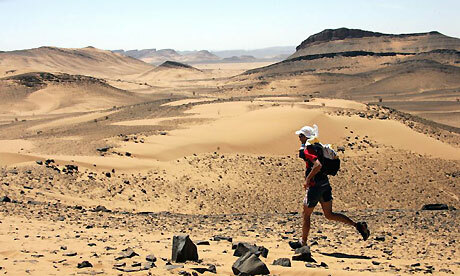 How do you run 135 miles through Death Valley in temperatures soaring over 120 degrees? Maybe a better question is how do you avoid running over a hundred miles through Death Valley when the road’s hot enough to catch your shoes on fire. ‘Cause if there’s any chance I ever have to do that, I will pay good money to get out of it. The real question, of course, is why you’d do something so crazy. Piling up and chipping away. Piling up means that each grain of new effort adds to the total. Chipping away means the pick head strikes the same spot each time. Because a thousand shallow holes do not make a well. He proves that it wasn’t. Posted on Sunday, July 3rd, 2011 at 11:02 pm. Filed under: Inspiration Tags: Bill Bradley, endurance	RSS 2.0 feed.